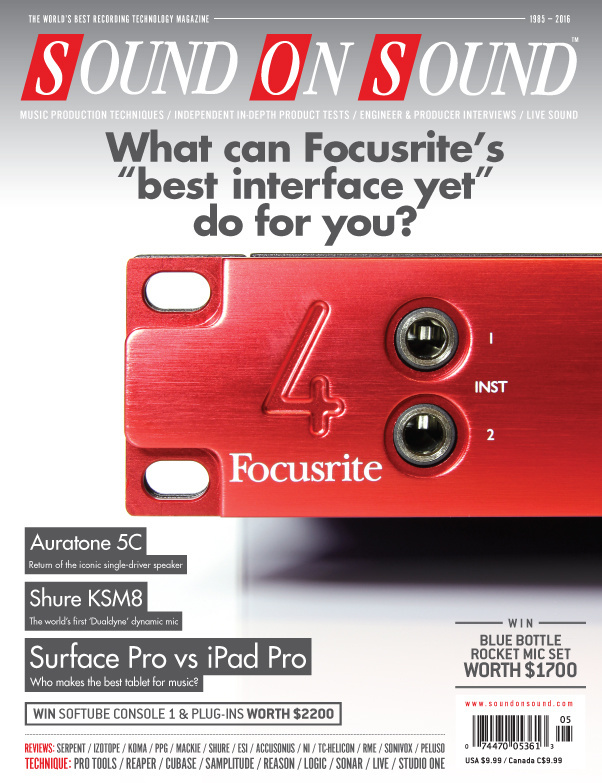 Reviews: Focusrite Red 4Pre (Cover), Shure KSM8, RME Babyface Pro, iZotope RX5, Koma Elektronik Komplex. Features: Welcome To 1979, Inside Track: Justin Bieber's Purpose, iPad Pro Vs Surface Pro. Accusonus’s innovative program brings advanced DSP to bear on a familiar audio problem. Auratone’s classic ‘grotbox’ is back. How does it compare with its modern imitators? Embertone are a US sound company founded in 2012 by composers Alex Davis and Jonathan Churchill. The two self-professed ‘sample-library nerds’. ESI’s Unik-series monitors have been extensively upgraded, and now offer even better value for money than before. These 1950s compressors are probably the most revered — and imitated — processors in the world. But what is it that makes them so special? Focusrite say the Red 4Pre is the pinnacle of their audio interface range. We put it to the test. The Koma Elektronik Komplex combines four step sequencers in one box, yet still manages to be greater than the sum of its parts. With its unusual driver configuration, this active loudspeaker hopes to do away with the need for separate stage monitors. A normal upright piano has three strings per key in the upper registers, two for the mid octaves and usually one for the lowest octaves. The Neumann U87 is one of the most iconic studio microphones in the world. Does Peluso’s homage do it justice? These files accompany the Sample Shop articles in the May 2016 issue. With options including mix-and-match ‘blue stripe’ and ‘blackface’ modes, this is far more than a simple clone of the classic UREI 1176. With its unique dual-diaphragm design, is Shure’s latest offering the greatest advance in dynamic mic technology since the Unidyne? This powerful vocal processor puts its controls right where you need them! Virtual Guitarist was a landmark product in 2002 and now it’s back, reborn in a new ferric guise. Live offers a number of ways to intelligently remap MIDI drum parts. Cubase 8.5 introduced Retrologue 2, a powerful virtual analogue synth, and its presets are great — but rolling your own patches can be a lot of fun. In a transition overseen by long-term collaborator Josh Gudwin, teenage prodigy Justin Bieber has become a grown-up pop star. With integration for Music Memos, new batch processing tools and expanded multithreading support, the Logic Pro 10.2.1 update gives you more power than ever. A directory of all media pages that hold the associated media files for May 2016 audio examples. Our engineer reworks a busy mix, to make the chorus and outro rock like they should. We explore the ins and outs of the new Track Freeze function in Pro Tools 12.4. Reaper’s automation lacks a relative trim mode, but now you can add your own. We show you how to organise your musical scrapbook in Reason. Zwiepack: Our engineer captured one jazz session using two completely different recording techniques. Which one won the day? Tie up those loose ends and declare your projects finished! The human head was not designed to wear two hats at a time. When studio owner Martin King left London to move up North, he was swimming against the tide in many ways. However, after six years in operation, the success of EVE Studios in Stockport has justified his decision. A tour of the legendary Hansa Tonstudio in Berlin, including the room where producer Tony Visconti devised and captured the now-mythic three-gated-mic technique for David Bowie’s ‘Heroes’. What can studios do to protect themselves when high-profile recordings get leaked? Media content for the May 2016 issue.